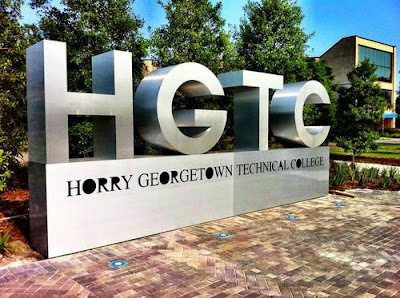 The Digitel Myrtle Beach has featured one of SGA’s current projects – a master plan & new entrance for Horry-Georgetown Technical College’s Conway, South Carolina Campus – on their site this morning. The signage and entry roundabout are the first elements of a master plan prepared by SGA Architecture. The signage – constructed of aluminum and designed by SGA’s landscape architects – reflects a new aesthetic adopted by the College. Over the course of several phases, the master plan will include the construction of two new academic buildings (100,000 square feet total) and the reconfiguration of vehicular and pedestrian pathways in order to create a more close-knit and walkable campus. (Photo credit goes to Andre Pope, author of The Digitel article linked above).